Sharing a room with her four year old disabled son, Brenda (not her real name), a single mother from Ladywood, is just one among the 37,000 households in Birmingham living in congested conditions, making the West Midlands accountable for almost half of families living in overcrowded accommodation across the country. With an increasing demand for properties, combined with an acute shortage of social housing, the idea of taxing council tenants who maintain a spare room seems reasonable, but a closer investigation into the matter reveals that this taxation may be affecting societies most vulnerable whilst only adding to a worsening housing situation. John Cotton, Labour councillor and cabinet member for social cohesion and equalities in Birmingham regarded the policy as “flawed” when expressing his concerns with the new welfare reform and the repercussions it will have upon social housing tenants in Birmingham. The under occupancy sanction, more commonly known as the Bedroom Tax, takes effect on April 1st 2013, as part of a larger reform of the traditional benefit system. The policy is an attempt by the Department of Work and Pensions (DWP) to encourage households to downsize if they have spare rooms, freeing up properties for larger families. This will see social housing tenants pay the price for maintaining a spare bedroom. However, what is deemed as a spare bedroom has become a controversial issue for many tenants and a talking point surrounding the policy, as many believe the guidelines to be unfair and dismissive towards certain groups within society. With 10,000 council tenants estimated to be affected in Birmingham and a further 5,000 tenants from registered landlords, the West Midlands will make up 9% of Great Britain’s affected claimants. Taking into account carers, children, spouses etc. it is estimated that around 60,000 people will be affected in total. The government have highlighted the terms and conditions of the sharing requirements which gives disabled tenants needing a non-resident overnight carer to be allocated the rights to an extra room, whilst children under the age of 16 of the same gender and children under 10 years of age, regardless of gender are expected to share. This means that those not complying with the new guidelines may be unknowingly maintaining a spare bedroom – a spare room needed by individuals such as Brenda; but what about those who are in need of that extra bedroom but are no longer entitled? One woman who is finding coming to terms with the policy difficult is a 59 year old scoliosis sufferer who after living under social housing within Birmingham for the past 31 years feels devastated to locate from her once family home. UK charity, The Fostering Network, have revealed the strain the Bedroom Tax is placing on foster carers as the policy originally failed to acknowledge the occupation of a room for a foster child, leaving carers vulnerable to the ‘spare’ bedroom tax. According to Birmingham City Council approximately 2,000 children are in care within the city with 60% in foster care, housed across a number of in-house homes and private sector accommodation. However, work and pensions secretary Iain Duncan Smith, has recently announced that approved foster carers will now be exempt from the policy, a policy which once classed foster carers liable to the housing benefit taxation. As part of an introduction of new regulations surrounding the policy, Mr Duncan Smith aims to support “priority groups” giving concessions both to foster families and armed forces. Although little or no consideration is still been given to many other individual in particular, separated families. Foster families were not the only group estimated to be affected by the policy, with little or no consideration originally being given to individual cases and exceptional circumstances of separated families, armed forces and the disabled. Local housing authority statistics suggest that 1 in 5 council tenants work full time and it will be this demographic who will be most affected by the Bedroom Tax in the UK as over 22% of council tenants are looking for work whilst more than 20% of council tenants in the UK have a full time job. Despite affecting a large proportion of society and causing distress to many, whether the implementation of the taxation will actually improve the social housing shortage within Birmingham is questionable. George Marshall, a research systems officer at the National Housing Federation, feels the housing crisis will make downsizing due to the taxation an issue for tenants as the need for two bedroom houses and single person flats increases while there is limited stock available, and this shortfall is unlikely to be met by the private sector as there is clear evidence where that private landlords are reluctant to take tenants from the social housing sector. According to the National Housing Federation’s 2012 Home Truths report, there is an urgent need for the construction of new build houses within the West Midlands. With 16, 629 people currently on the housing waiting list, Birmingham maintains the second largest housing waiting list within the West Midlands, an issue which both John Pierce, campaign officer at the National Housing Federation, and Councillor John Cotton, feel needs addressing in order to boost the economy whilst solving issues of homelessness and overcrowding within the city. In an attempt to handle the housing crisis and frame a response to welfare reform in Birmingham, partnerships and campaigns such as ‘Yes to Homes’ and ‘WMBUS’ have been established within the region. Yes to Homes, aims to create more land for house building and therefore more homes for the people who are suffering from overcrowded conditions. The campaign recently found available land in Birmingham equivalent to two cities the size of Wolverhampton. Mike Sharpe, Labour councillor and chairman of Birmingham’s planning committee, recently praised a developer on his plans to build eight new homes and six new workshops in Birmingham’s Jewellery Quarter which offers six, four bedroom houses and two, two bedroom apartments. These smaller sized properties are what is needed to boost the economy and to solve the housing crisis; however, this is still a small proportion of a larger housing scheme which needs to take place within the city. Birmingham’s reaction to the Bedroom Tax under the new welfare reforms have encouraged numerous protests within the city around the Council House to demonstrate people’s dissatisfaction with the policy. The Socialists Workers’ Party, were also among the protests as Andrew Howard, a member from the party demonstrated that the Bedroom Tax would only increase issues within society. However, Mr Tom, a representative of the campaign group ‘Birmingham against the cuts’ felt the policy was unfair. According to UK charity Scope, out of the 660,000 people estimated to be affected by the Bedroom Tax in Britain, 420,000 are disabled. Scope reveals this is due to individual cases with specialist needs who need a spare room for medical equipment or for when a carer stays, whilst some are simply too sick to move house and downsize. With the Department of Work and Pensions making concessions to the original policy, the disabled are being given increasing awareness within the policies exemptions due to the press attention of individual cases. Richard Gorry father of five, appealed against the policy due to his concern about the discrimination the policy inflicted against the disabled as his two children were unable to share bedrooms due to their disabilities. Iain Duncan Smith has since gone on to highlight that those like Richard Gorry, whose children are severely disabled, will be exempt on loosing part of their housing benefit. The taxation on the spare bedroom relies upon the number of spare bedrooms and the price of the property rental, although according to the government’s impact assessment report the estimated average loss in benefits will be £14 a week. With many unable to meet the financial demands of the taxation and with the limited housing stock availability to downsize, it is areas such as Ladywood that are most likely to feel the effects of the policy. Councillor John Cotton considers the Bedroom Tax to be “widening the gap of inequality” within the city effecting Birmingham’s most deprived areas as Birmingham City Council revealed that almost half of residents in Ladywood are either council tenants or live in a Housing Association. With only 29% of Ladywood council tenants using just one bedroom, a potential of 71% may be affected by the Bedroom Tax whilst Erdington, Northfield and Hodge Hill are also expected to be highly affected by the policy. In an attempt to support tenants and those estimated to be affected by the Bedroom Tax, Councillor John Cotton highlights the ways Birmingham City Council are attempting to handle the “consequences” of the policy. By setting up a multi-agency community with advice agencies, councils and housing associations, Councillor John Cotton attempts to frame a response to the welfare reform, where food banks, advice and support for social housing tenants can be accessed. Birmingham City Council also look to help tenants avoid the taxation by providing solutions to the policy through lodgers, downsizing and providing financial support with the help of the Citizens’ Advice Bureau. The overall effect of the Bedroom Tax will only increase problems to society’s most vulnerable rather than solve and acknowledge the problem of overcrowding in the social housing sector. After recently receiving numerous letters of complaints surround the policy by registered charities, Iain Duncan Smith has ordered officials to look again at the policy and the implications it is causing upon society. With recent concession made to the bedroom policy towards foster families, disabled and armed forces the enforcement of the policy clearly demonstrates the governments ill-thought out plans towards the policy. Whilst this review is progressing Birmingham is doing its best to deal with the current situation and support those who will be affected by the Bedroom Tax with websites offering support and guidance. This week protesters turned out in their masses at Birmingham’s Council Hall to voice their disdain with cuts, including the bedroom tax, that the government are putting through. Retired teacher Lynn Gregory gave us her opinion on the Bedroom Tax yesterday at the protest outside Birmingham City Council House. Foster Parents hit by Bedroom Tax. As of April 2013 foster carers across Birmingham will be left paying between 14% and 25% of their current housing benefits whether there is a child occupying the room or not. There are approximately 2000 ‘children in care’ at any one time in Birmingham, according to Birmingham City Council, whom they are responsible for and “aim to find stable, secure and caring homes” for. These looked after children may be housed across a number of in house homes and private sector accommodation, but as of 2009 1190 of children in question were in foster care. That’s 60% of all Birmingham’s looked after children who’s carers potentially stand to shoulder the short fall. This is down to a technicality with the current benefits system, according to the current outlines “when calculating how many bedrooms a family unit require, a room for a foster child will not be taken into account. Therefore, a household that has an extra room for a current or potential foster child will be treated as under-occupying”. So for a foster carer who has one bedroom set aside for a fostered child, and is in receipt of the average housing benefit of £89.27 per week, will now have to pay £12.50 of that back, a shortfall that could be at the cost of the child. If a carer has two or more rooms for foster children that amount jumps £22.32. Birmingham City Council Adopt/Foster Appeal. Ethnically diverse areas of Birmingham to be most affected? Statistics released by Birmingham City Council, indicate that the most culturally diverse areas of Birmingham are likely to have the highest rates of people affected by the Bedroom Tax. 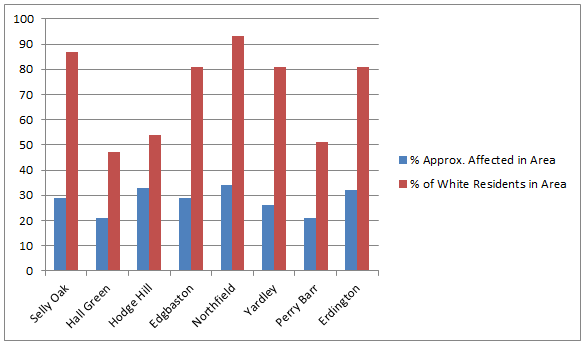 Ladywood, possibly the most affected area, has the lowest proportion of white residents in Birmingham at just over a third. 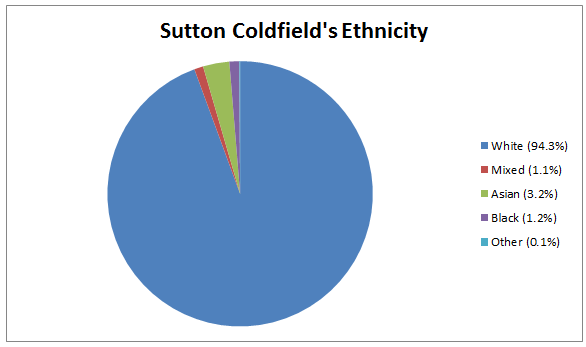 The predicted least affected area of the city is Sutton Coldfield, where a massive 94% of its residents are white. As previously reported, less than 10% of Sutton Coldfield’s population is expected to be affected by the Bedroom Tax, in comparison to almost half of Ladywood’s residents. 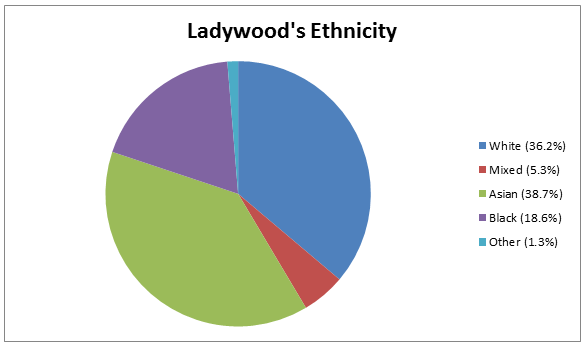 More specifically, Ladywood’s population includes 2 percentage points more Asian residents than white. Over 5% are mixed and almost 1 in 5 are black. Sutton Coldfield’s ethnic makeup could not be more different. Just over 3% of its residents are Asian, around 1 in 100 are of mixed race and the same amount are black. Other areas of Birmingham predicted to be fairly highly affected by the Bedroom Tax are Erdington, Northfield and Hodge Hill. Those expected to not see many effects of the benefit cuts include Hall Green, Perry Barr and Yardley. However, Hall Green, Hodge Hill and Perry Barr are the other locations in Birmingham to have a high proportion of ethnic minorities, with only around half of residents in each area being white. Hodge Hill particularly shows a negative relationship between ethnicity and these benefit cuts, with around a third of residents potentially affected. Sutton Coldfield to be the least affected area of Birmingham? 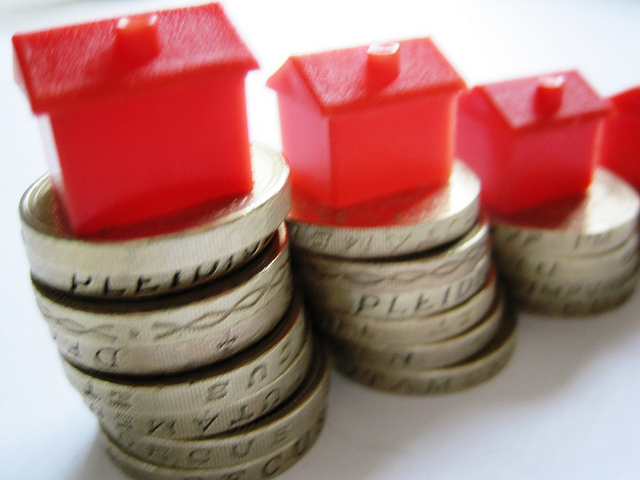 Less than 10% of Sutton Coldfield residents may be affected by the Bedroom Tax. This area is expected to see the least effects in Birmingham as of April 2013, when the new policy comes into action. 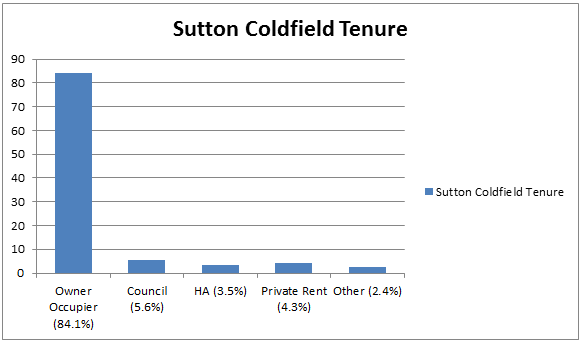 Almost 6% of Sutton Coldfield residents live in a council owned house and only 3.5% are living in a Housing Association property. This is a massive 39 percentage points less than the most affected area of Birmingham, Ladywood. Hall Green, Perry Barr and Yardley are other areas of Birmingham which indicate fairly low rates of Local Authority and Housing Association properties. The data released by Birmingham City Council, suggests that less than a quarter of each of these regions’ populations are likely to be affected by the Bedroom Tax. 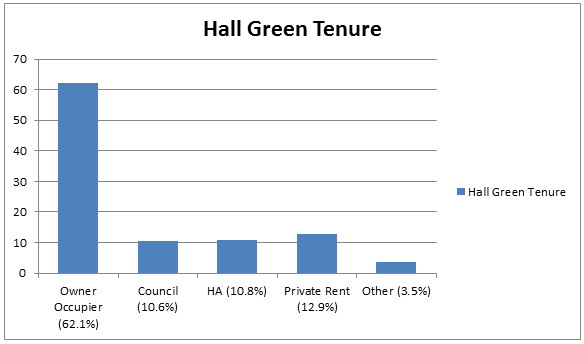 Approximately 1 in 5 of Hall Green’s residents may be potentially affected, with around 10% living in Local Authority Housing and the same amount depending on the HA. 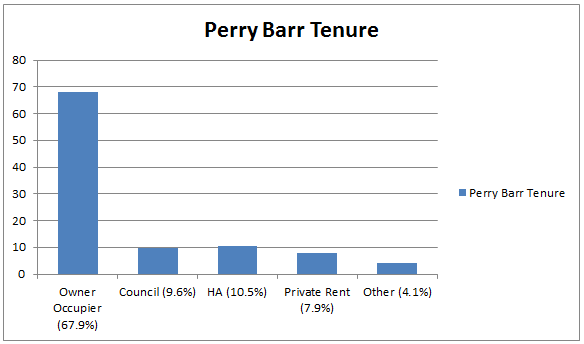 Perry Barr shows very similar data. Just over 9% of residents are council tenants and only a tenth live in a property provided by the HA. 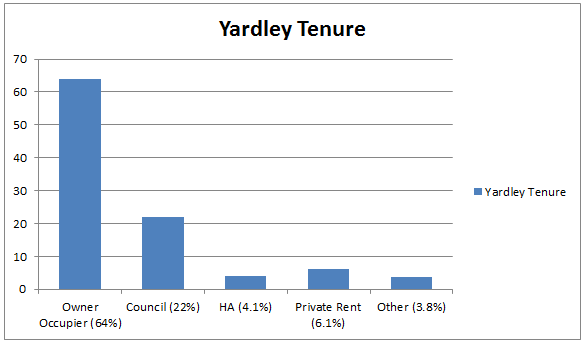 Yardley indicates slightly different rates, with just over 20% living in a council house and a further 4% occupying a HA property. This map shows where these lowly affected areas are in Birmingham.